Asana is Sticker Mule's task management platform. We use it to create, track, assign, discuss and complete every task that isn't managed by a specialized system. Asana is flexible and feature rich which makes it intimidating at first. There's no definite way to use Asana correctly. To get full value requires upfront effort and a willingness to agree on conventions to standardize use. 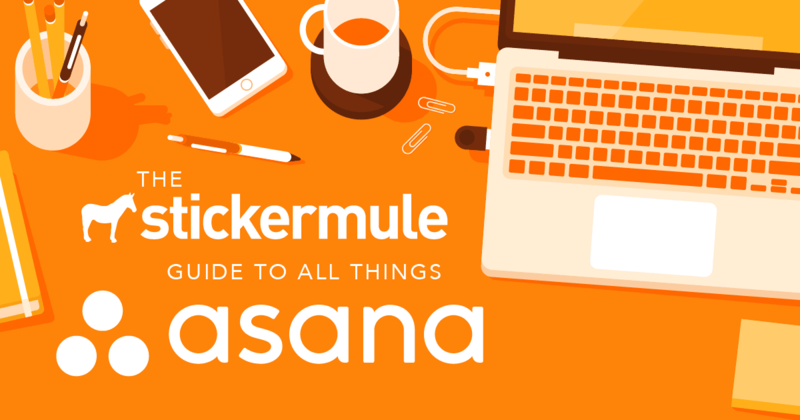 We wrote this guide to explain how we use Asana at Sticker Mule. We designed it as a reference for our team and have published it for other teams that may find it useful. Asana encourages you to create teams of people that manage projects comprised of tasks and subtasks. We generally do not use it in this manner because most of our projects are small. It doesn't make sense for us to create hundreds of projects so we redefined Asana's conventions to categorize our work. It doesn't make sense for us to create hundreds of projects so we redefined Asana's conventions to categorize our work. The product design team categorizes improvements to our product (i.e. web site & related apps) by placing them in categories (via projects) for each functional area (i.e. cart, checkout, reorders, reviews, etc.). Periodically, we prioritize tasks within each functional area (i.e. project) using section headings to sort tasks by priority. When we start work on a particular area, we can quickly scan a list of related improvements sorted by priority. For example, if a developer is working on the cart, they may look at the cart project to quickly grab a few extra tasks to complete. The development team categorizes development work by creating projects to track: defects, rough edges, high priority tasks and our roadmap. The roadmap provides a high level overview of the main improvements we intend to make. We also stay focused by using a "rough edges" project to categorize non-critical improvements that won't be noticeable by most users. Most "rough edges" are rather easy fixes and our team will tackle a few in between pursuing more substantial projects. Finally, we will sometimes create projects to track actual projects our dev team is pursuing if they are substantial in size. The operations team organizes work that's related to operational improvements. Since most operations projects are substantial, we use Asana projects within this team to track actual projects. The projects are roughly sorted by priority from top to bottom so anyone can monitor them. Additionally, we have a catch all project called "Ops ideas" that tracks ideas that may lead to operational improvements. Anyone is free to post an idea to the "Ops ideas" project. If a task within that project is green-lit, and seems substantial, we may convert it to an actual project. The marketing team includes projects that categorize work by functional area (i.e. email, advertising, content, conversion, launches, etc.). Within each project we use section headings to sort tasks by priority. Additionally, we have a "Marketing ideas" that tracks tasks which don't fit into an existing category. Ideally, one person would own each area, but our team is still small so most people oversee a few areas. The customer service team includes a "CS ideas" project that tracks tasks that lead to customer service improvements, a "FAQs" project that tracks FAQs we need to create or revise and a "Rush" project that tracks orders which must ship early. Anything posted to the "CS ideas" project is intended to have 2 specific results: improve customer service efficiency or reduce the need for customers to request help. The human resources team includes a "Positions" project that tracks all open & potential positions. We use subtasks within each position to track additional tasks that need to be performed to fill the position (i.e. post ads, create job description, etc). We also have an "Onboarding & Training" project where we create tasks to represent each new hire and subtasks that reflect the onboarding and training tasks for that person. Use sentence case. It's Easier To Read. Order new chairs for the office. Be concise and comprehensive. Needless words waste an assignee's time but so does making them ask for clarification. To speed up Asana adoption we encourage everyone to turn off email notifications to get used to relying on the Asana inbox. We give everyone Asana tasks as part of their onboarding so they start using the platform immediately. Example onboarding tasks we'll assign include "Place a free order using store credit", "Review and sign company handbook", and "Turn off email notifications in Asana". We give everyone Asana tasks as part of their onboarding so they start using the platform immediately. Asana let's you organize your personal task list by putting tasks in either today (Tab+Y), upcoming (Tab+U) or later (Tab+L). Generally, we put current tasks in "today" even if they're not to be done today and use "upcoming" to track pending tasks. "Later" tracks tasks we might do. It's helpful to categorize work using projects but don't agonize trying to find the correct project for every task. The important thing is to create tasks, assign them to the proper person and notify the relevant people using the followers feature. We often put tasks in multiple projects. Most team members only care about a limited set of projects (i.e. task categories). To better coordinate, we sometimes categorize task in multiple projects so that relevant people can quickly view them. For example, a task could be in the "CS ideas" and "Checkout" project if it's both a benefit to our CS team and related to our checkout. We encourage everyone to create tasks using the "Tab + Q" keyboard shortcut. It speeds up the task creation and helps you quickly put all of your tasks in Asana. We encourage each other to create tasks Asana when they're identified via another channel (i.e. in person or Slack). Usually, this is as simple as saying "Can you make a task in Asana and assign it to (me, yourself, another person)". This is especially important with new team members so that using Asana becomes habit forming quickly. Asana's templates feature is imperfect so we maintain our templates in a Google Doc. Often we'll post templates to a project description for quick access. For example, our "Onboarding and training" project includes a template of common onboarding tasks. A team members can copy & paste this list of tasks to create subtasks that need to be completed to onboard a new hire. Hopefully Asana builds a real templating engine to make it easy to manage lists of re-usable tasks that can be added as subtasks to existing tasks or as tasks to projects. It's common for new team members to embrace Asana reluctantly only to become emphatic proponents within a few weeks. Since Asana is more complex than other task management platforms, it's common for new team members to embrace it reluctantly only to become emphatic proponents within a few weeks. Without Asana, and our conventions for using it, we wouldn't be able to gracefully coordinate and grow a remote team. While Asana is a big help, it can just as easily become a big mess without care to keep it well organized. As we continue to grow and launch new products (like custom magnets), our documentation and conventions will continue evolving. Our team works extraordinarily well together not just because we share the same tools, but because we share a similar perspective on work. We all tend to be humble, independent, logical, thoughtful and autodidactic. If you have these characteristics too, we're hiring.